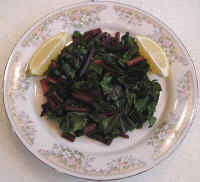 Steamed beet green make a nice vegan addition to any meal or may be served as a main dish. This recipe will serve 2 adults as a main meal, or make 6-8 side dish servings. Leftovers can be stored in a covered container in the refrigerator. 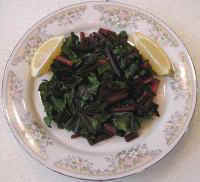 Cold steamed beet greens also make a wonderful addition to a mixed green salad. We have found that it is best to prepare the beet greens within a day or two of purchase, as they begin to wilt rather quickly. Begin by cutting off the leaves and stems of the beets close to the top of the root. Place the roots in the vegetable drawer of your refrigerator for future use. Thoroughly wash the leaves and stems, allowing them to drain for a few minutes. Cut the leaves and stems into bite-sized pieces and place in a covered glass pot for cooking on the stove-top or in a covered ceramic or glass baking dish for cooking in a microwave oven. If cooking on the stove-top, make sure that there is a little liquid in the bottom of the glass or stainless steel pot. The water from washing should be enough, or add about a tablespoon of water. Cook on low heat until the beet greens are cooked. We prefer the stems to be a little crispy, which takes about 5-7 minutes. If cooking in a microwave oven, no additional water is needed. Cook on "high" for about 3-5 minutes until tender. Serve with lemon wedges. Enjoy!